In their search for food (wood/cellulose) and moisture, subterranean termites will squeeze through cracks as narrow as 1/32 of an inch to enter your home! Expansion joints, foundation cracks, tiny gaps around plumbing, and service entries are all potential entry points. And once they’re in, undetected termites can mean untold damage. Unlike subterranean termites, drywood termites do not require contact with the soil in order to live. Consequently, they can enter your home on any floor or through your attic, rather than through cracks and gaps near your home’s foundation. When it comes to gaining access to your home, termites are amazingly proficient. The last thing you want to do is make their job easier. Follow these 3 steps to effective termite prevention and make sure that your home doesn't become their home. Small holes in wood, crumbling drywall, sagging doors or floors, insect wings and small shelter tubes are some of the more obvious signs of a potential infestation of termites. But even if you don't notice any of these signs, that doesn't necessarily mean termites, or the conditions that invite them, aren't there. Regular inspections by a licensed pest management professional are the best way to help ensure your home truly is, and remains, free from termites and the damage they cause. Qualified pest management professionals have the training in termite biology and behavior to identify, prevent and treat termite infestations. A Certified Professional will perform a thorough inspection of your home to determine if, where, and how termites are getting in. 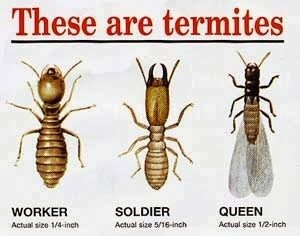 They can also explain how to correct any conditions in your home that invite termites. A clean bill of health from a doctor today doesn't mean it's not important for you to get regular check-ups in the future. Your home after a Termidor treatment is no different. Regular check-ups by your pest management professional will make sure Termidor continues to do its job and that your home remains termite-free for as long as you live there. A typical colony of a particularly aggressive termite species called Formosans could search an area about the size of a football field and damage the wood.